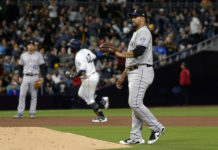 Opening Day came with a dose of good news for the Colorado Rockies and injured starting pitcher Jorge De La Rosa (groin). Patrick Saunders of the Denver Post is reporting that De La Rosa is progressing well with his rehabilitation from a strained left groin and is on pace to start for the Rockies on April 14 when they visit the San Francisco Giants. De La Rosa aggravated his groin injury twice during Spring Training – limiting the 34-year-old to just 2.1 innings of work in preparation for the 2015 season. He posted a 14-11 record with 4.62 ERA in 32 starts last season. The lefty threw 45 pitches without any issues in a simulated game on Sunday. The plan is to increase that number to around 65-75 pitches in a rehab start for Triple-A Albuquerque on Thursday night. As long as De La Rosa doesn’t suffer any setbacks, the Rockies’ No. 1 pitcher will join the club just in time to pitch in the first game in which they need to utilize a five-man rotation. 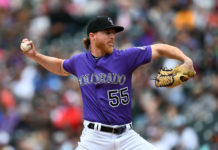 Colorado plans to use a four-man rotation of Kyle Kendrick, Jordan Lyles, Eddie Butler, and Tyler Matzek until the matchup with the Giants on April 14. If De La Rosa is unable to make his season debut at that point, the Rockies will have to look elsewhere to fill out their five-man rotation. Christian Bergman is the most likely candidate to take the mound if De La Rosa isn’t able to go.